Once again we head out of camp just before sunrise, racing to find a suitable foreground subject for the golden light of sunrise. This morning looks a lot more promising, with a lighter cloud cover that seems to diminish as we make our way through the reserve. 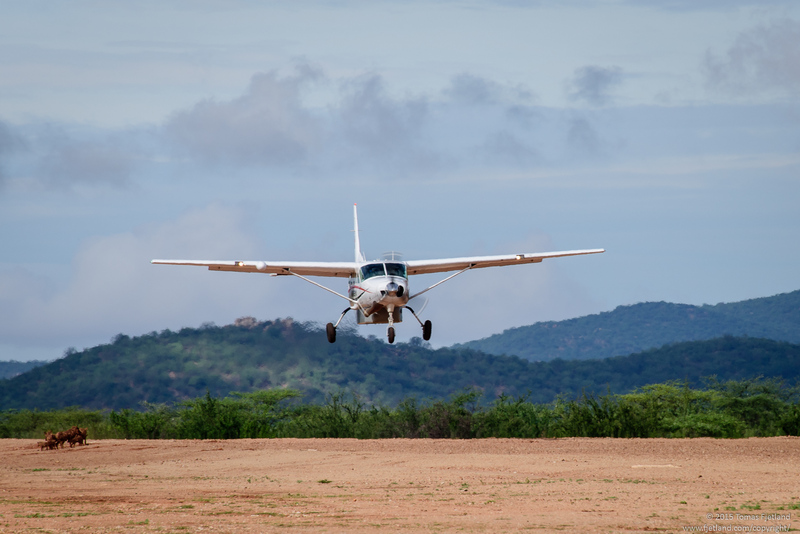 Clouds clearing as the sun rises over Samburu. The characteristic Doum palm in the foreground. We don’t find any Oryx in time for that first flush of warm light, but we do find a Secretary bird in an Acacia tree. We stop to see if we can’t make something of the opportunity. I have some shots from earlier I’m really happy with, so I decide to try to go for silhouettes, since these birds have such a characteristic shape and interesting behavior. Secretary birds don’t seem all that comfortable in the tops of Acacia trees (well, they’re trees with 5cm long thorns, who can blame them? ), and tend to change positions now and then. As they do, they seem uncertain about their own ability to keep balance, so they often spread out the wings to help with the balance. 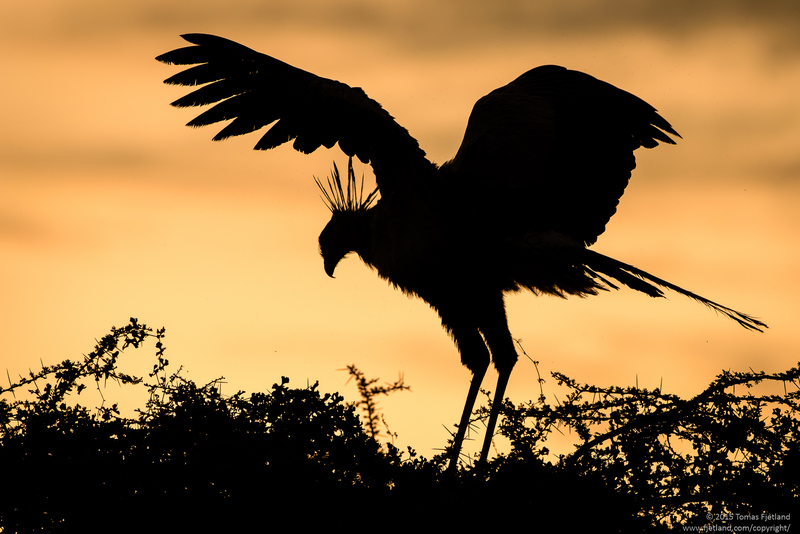 Silhouette of a Secretary bird in the top of an acacia thorn tree against the sunrise. After giving us some nice poses, the Secretary bird takes off, and we continue to scout for subjects. Shortly after we come across a small group of Oryx. We haven’t seen many of them on this trip, so I’m happy we came across some while the light was still fairly good. 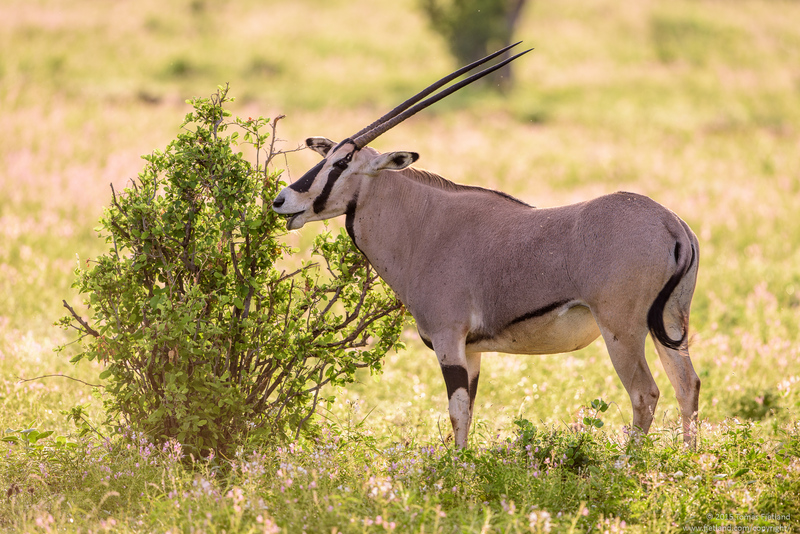 An Oryx enjoying the leaves of a bush in a meadow of flowers. As the sun rises behind him the meadow is bathed in golden light. One of the nice things about travelling a bit later in the season than the more standard august-september, is the first (short) rain season will have passed, and the landscapes are so much more lush and green. And in some places like this, flowers will cover the ground, which really adds something to the pics, I think. 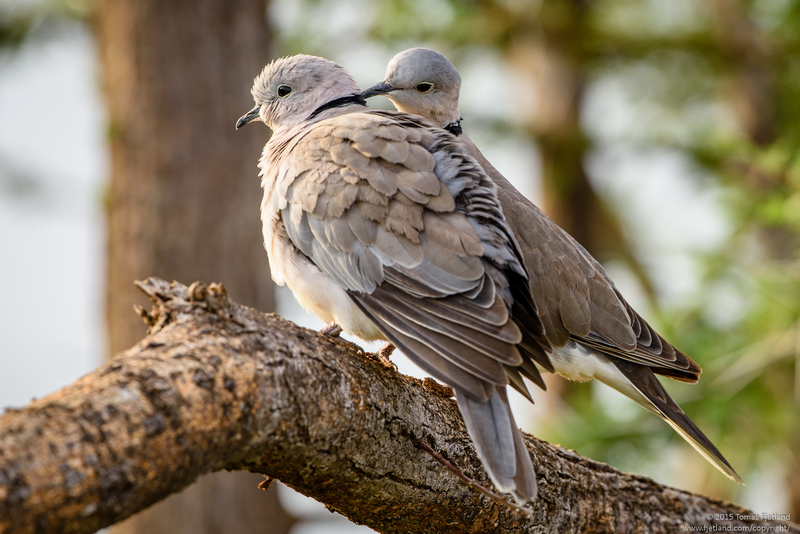 Two Ring-necked doves acting like turtledoves in a tree in Samburu. After a few days of showers and windy, chilly nights, it seems it wasn’t just us photographers that appreciated the warm morning sunlight. 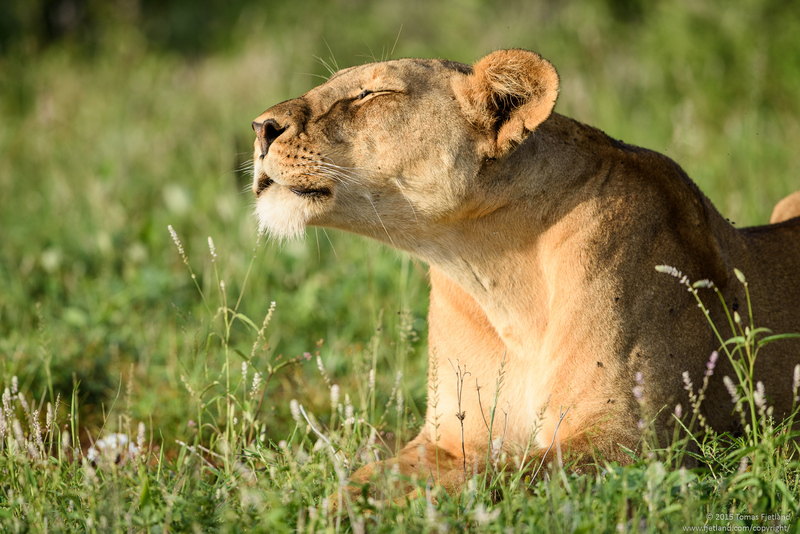 A lioness obviously enjoys the first warmth of the sun in the morning. Her cubs are sleeping in the bushes nearby and she’s obviously enjoying some peace and quiet in the morning. 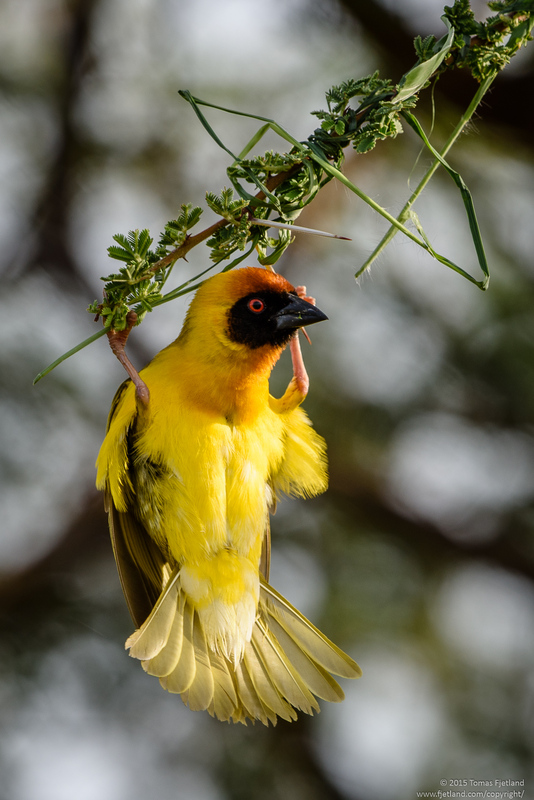 Samburu is home to a large number of weaver species. There are heaps of nests hanging from practically every tree in the reserve. 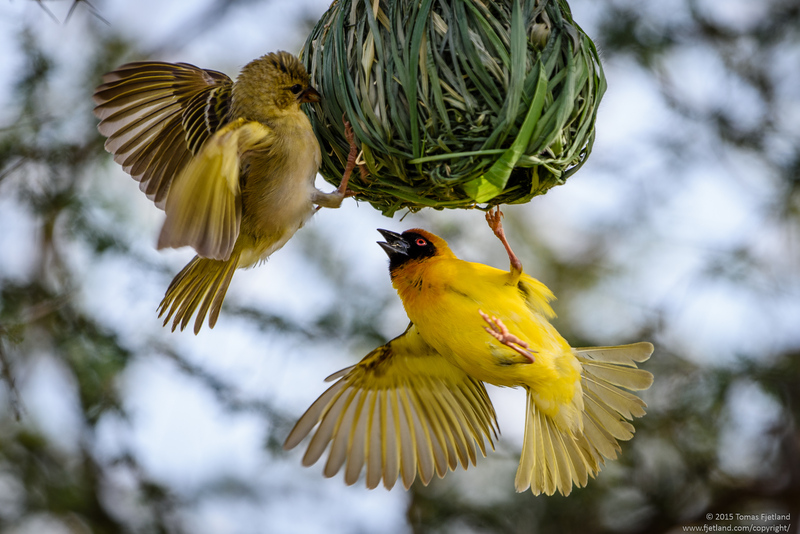 We were lucky enough to come across a Vitelline masked weaver who was busy both showing off a newly constructed nest, as well as building a new one from scratch. 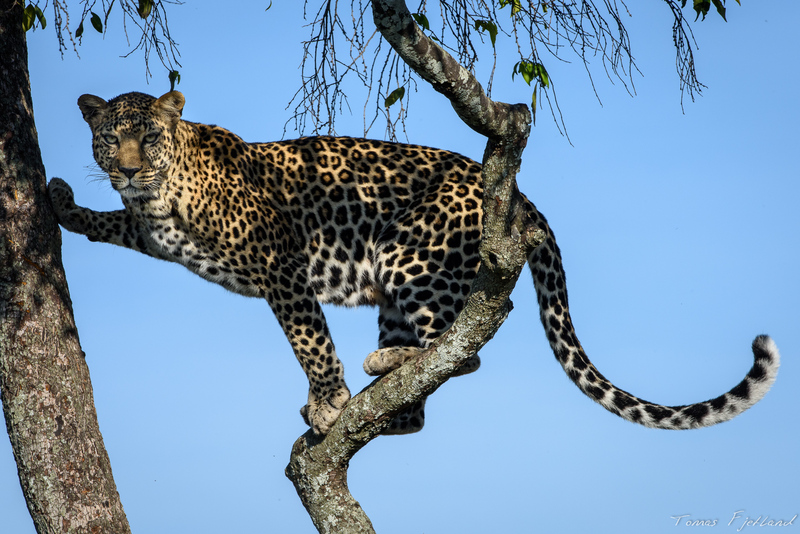 He had been considerate enough to do both in a tree fairly close to the path. 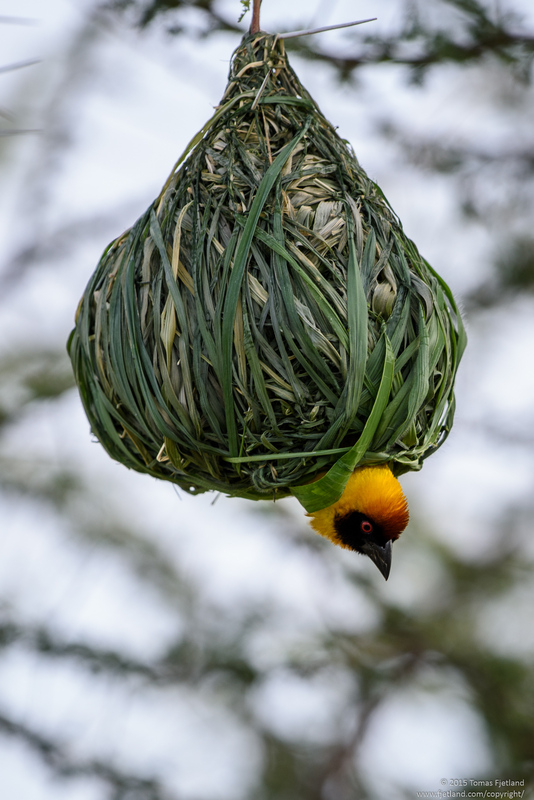 This Vitelline masked weaver had recently finished this nest, but was already busy building another one, just in case this wouldn’t be enough to attract a female. A Vitelline masked weaver starting a new nest. Making sure the attachment to the branch is secure is the most critical stage. 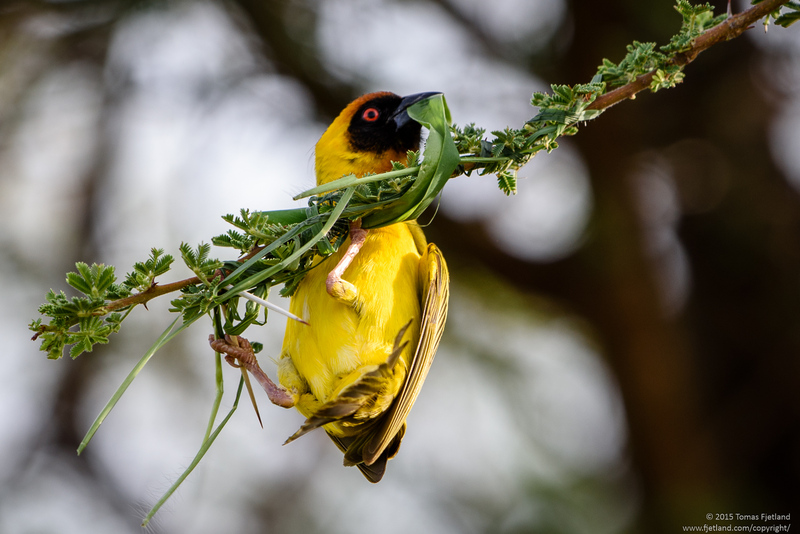 Weaving in a solid leaf over the thinner straws to add strength, this Vitelline masked weaver builds more nests to increase his chance of impressing a female. 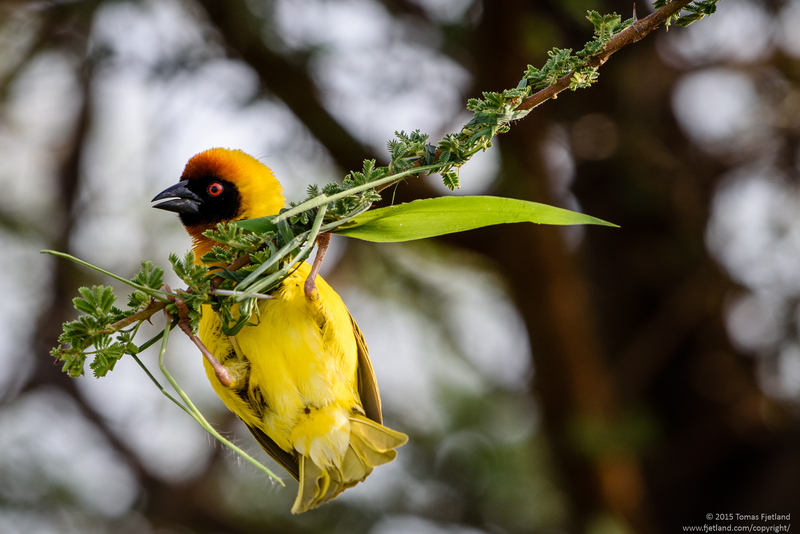 Regularly checking the surroundings for predators, this Vitelline masked weaver doesn’t want to risk getting caught off guard while building his nest. It’s rough conditions out there in the bush, I tell you. It’s a battle for existance. 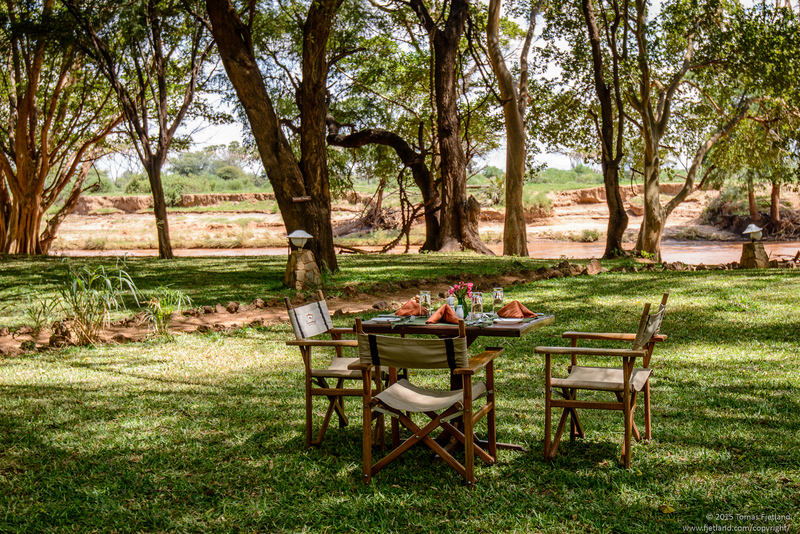 The Ewaso Ngiri river flows past the camp in the background. Guide Joshua looking in disbelief at the amount of stuff we’re hauling in and out of his Landcruiser for every drive. This time we head eastward along the north bank of the river, past the Elephant Bedroom camp. We pass some Ostriches, and even more Elephants. 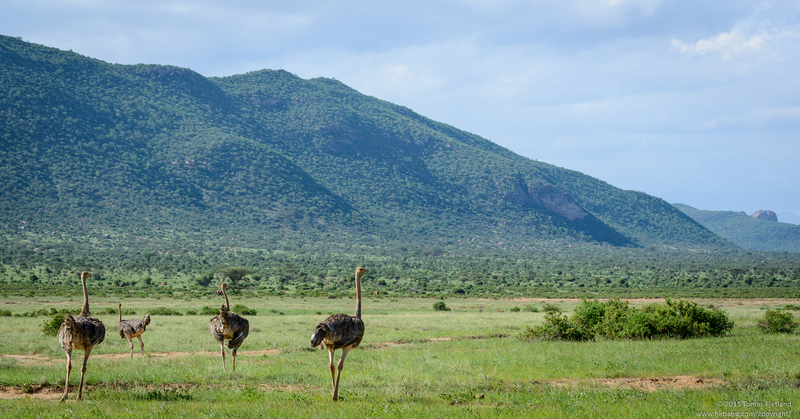 A group of young Ostriches. The beautiful Lilac-breasted Roller poses in the top of a dead tree. 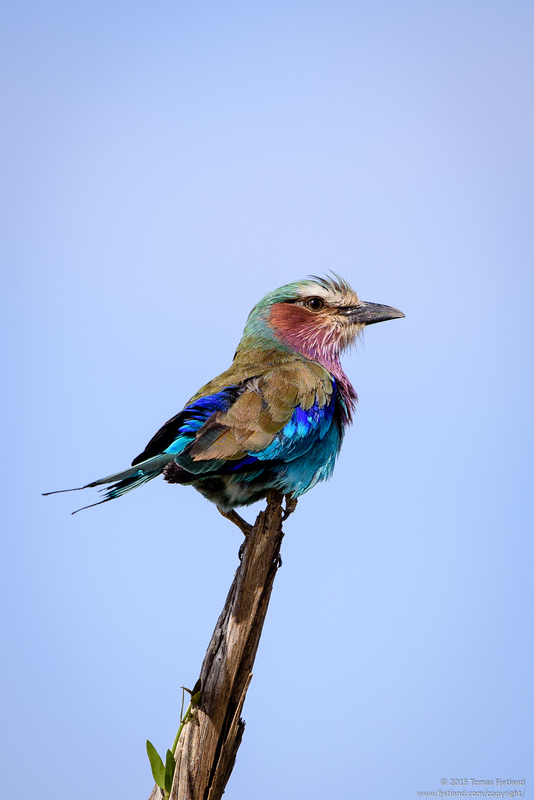 No doubt one of the most beautiful birds of east Africa. I didn’t think it would be possible, but with all the elephants in the area, I was almost starting to get a bit blasé with regard to them. Almost like you start not noticing the Wildebeest in the Mara after you passed a few thousand. But then as we stopped by two large Elephants that seemed to be calmly grazing beside each other, away from other groups, things changed quickly. 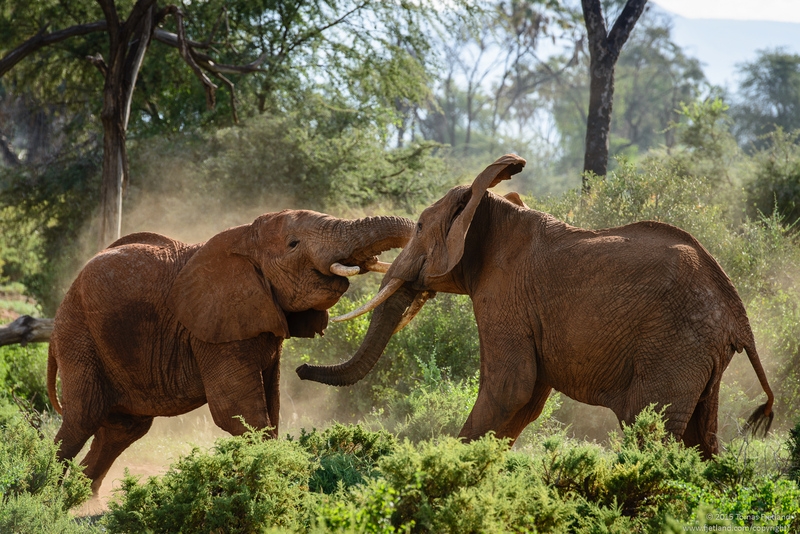 Two Elephant bulls in a fight. 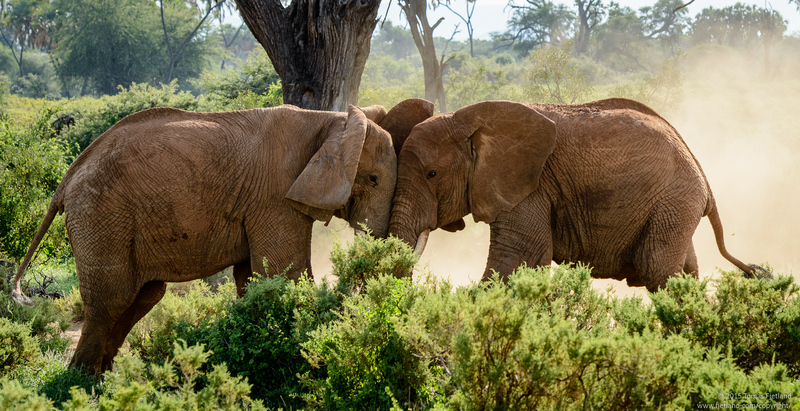 Equally matched elephant bulls can have standoff/fights that lasts for several days. In this case it was seemingly over within half an hour. 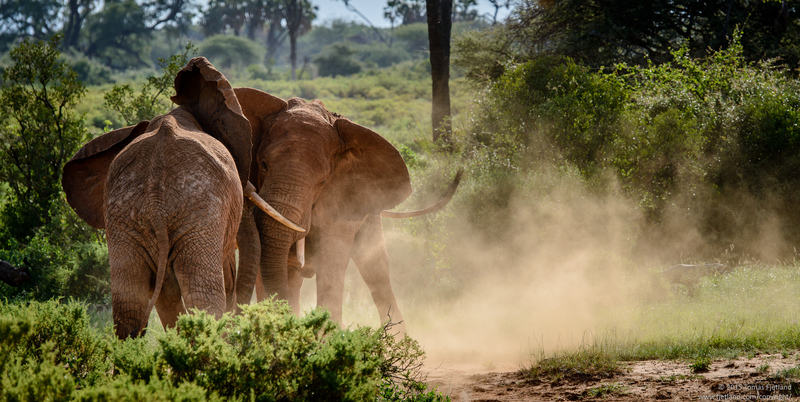 Elephant bulls going head to head in a clearing in Samburu. When two large Elephants get in a fight on the dusty sandbanks of the river, the dust clouds they kick up can be seen from far away. 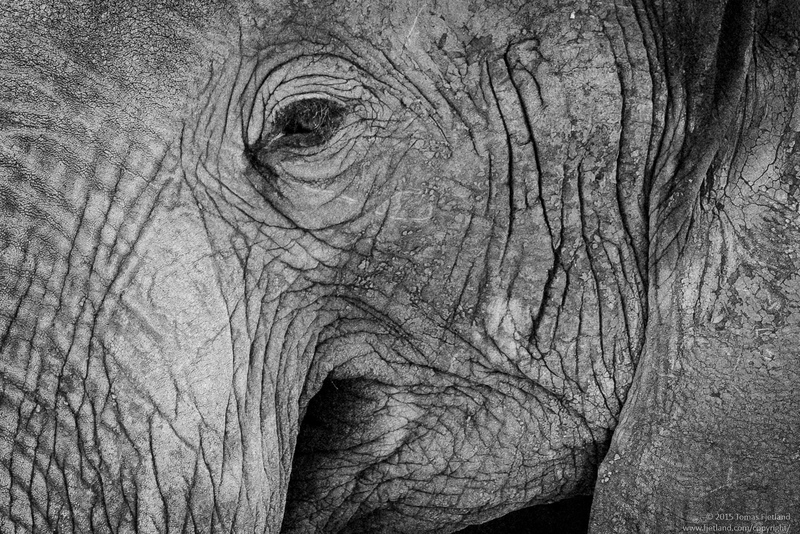 Black and white portrait of a battleworn Elephant male. Samburu (the north of Kenya) has some distinct subspecies of well known African animals that aren’t exactly like the ones you find in southern regions of the country. I’ve already mentioned the reticulated giraffe, which has a different pattern than its southern “mara” cousin. 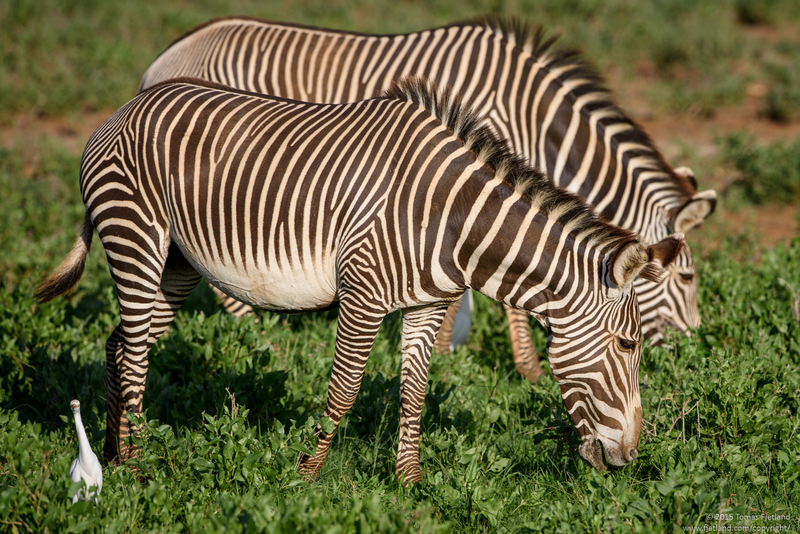 The Zebras are also noticeably different, with the Grévys Zebra being larger and more horselike than its mara cousin. It also has denser stripes, and the stripes don’t go all the way down to under its belly. We came across a group of these with one “mara” zebra that had teamed up with them. Joshua didn’t seem to have any idea how it made it here and why there was only one either. 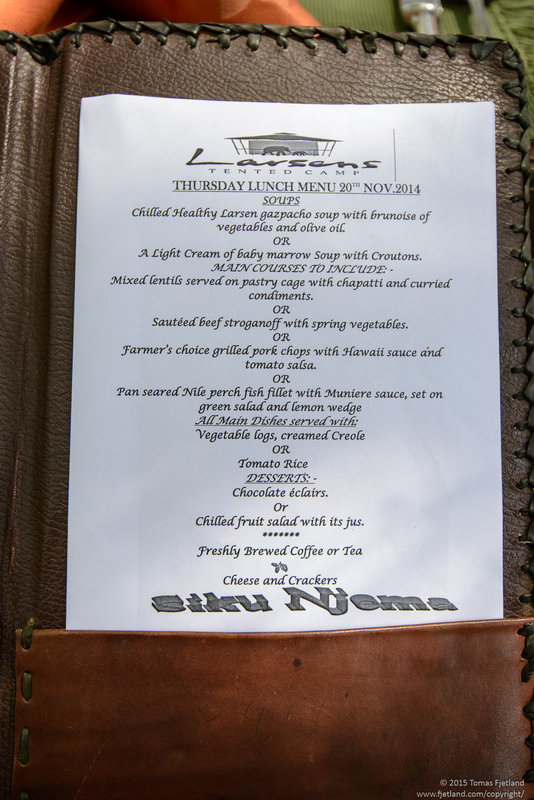 Samburu is normally home to herds of Grévys Zebras, a distinct subspecies of Zebras. Here a lone “Mara” Zebra has joined them. A pair of Grévys Zebras. Notice the denser stripes and how the stripes don’t go all the way down and under the belly like on “Mara” Zebras. As we were getting closer to sunset we started heading back toward camp, hoping to find a suitable subject to shoot against the sun setting. 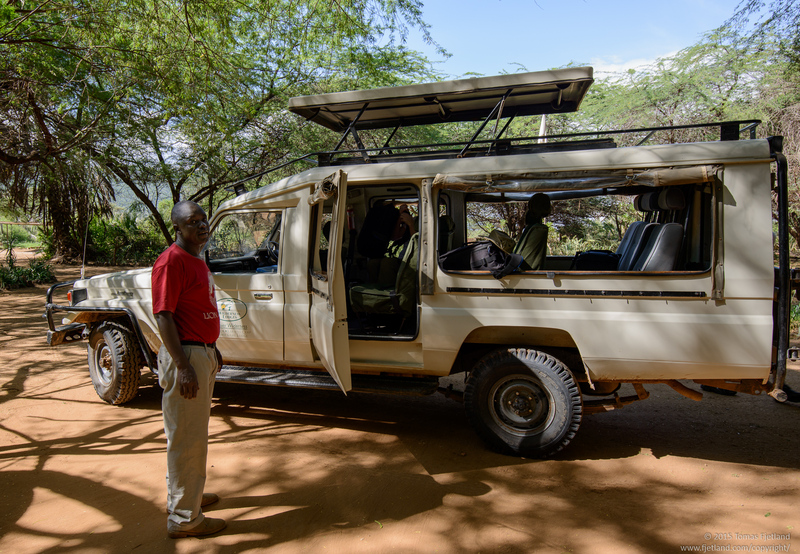 But somehow all the animals had suddenly disappeared and we couldn’t find anything, which was a bit disappointing for our last evening drive in Samburu. We saw the tail of a Caracal disappearing into the undergrowth, but that was as close as we got.